The vacancy in Toronto Centre started a countdown for a permanent answer on the elephant in the room question. Would we return to active duty in elected life? In 2013 the only energy I can muster for politics is to help push and shove my leader forward. Forward to rid our country of a government that has a very different view of Canada than mine. I won't be a candidate now. I won't be contesting a riding in the 2015 general election or any other. I will, as always, be an active Liberal volunteer and I look forward to knocking on doors in Toronto Centre whenever the by election comes. We'd only just finished booking tickets for a family vacation to Costa Rica in August when Bob Rae announced that he planned to step down from the House of Commons. From then on the debate in our house was about whether we were going to divert from the FFF path (fun, family, finances) that we have been enjoying since my unplanned departure from politics nearly three years ago. On the other hand we had the delicious prospect of returning to politics in the territory where I have been elected three times and where I was very well supported in my campaign for mayor. After all I am deeply in love with Toronto Centre. I know her ravines and I know her alleys and there's not a room or a nook or a cranny of that territory that intimidates me. It's where I cut my teeth on politics, fought the battles for equality, for good services, for access, fairness and for safety. Over the years I was given the privilege of putting my imprint on a riding that has put it's imprint on me over decades. Even more tempting was the chance to reassemble the team that had helped me win three times in Toronto Centre and municipally helped me garner nearly 300,000 votes while raising more than $2.2 million. More than anything else the thing that I miss about my exit from active politics is the family that one gains from it. Since I was a boy in Etobicoke I have relied upon politics for a steady supply of great and loyal friends, or political family, as I like to describe them. Representing Toronto Centre in the House of Commons was a topic that Bill Graham and I discussed often and were it not for my role as Minister of Health and Deputy Premier in Ontario at the time of Bill's retirement I would have run to replace him. And so the vacancy in Toronto Centre started a countdown for a permanent answer on the elephant in the room question. Would we return to active duty in elected life? Being forced to answer that question came sooner than we had predicted but make no mistake we were at our fork in the road. Christopher and the kids and I used Gay Pride weekend to see how the craft of politics could be adapted for family. 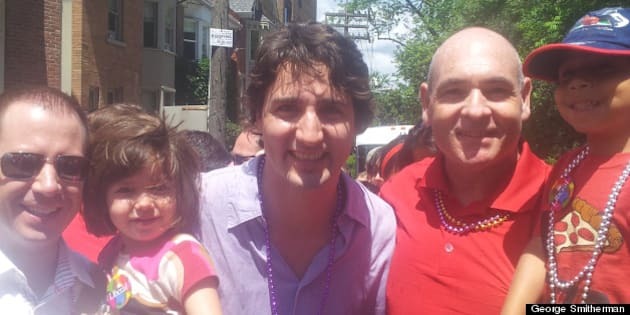 At various times during the Parade I had one of my kids up on my shoulders, whether Kayla waving and shouting Happy Pride in mimic of me, or Michael twirling and whipping coveted Kathleen Wynne red bead necklaces into the 6th row of spectators. We had a great time. And we came away from that weekend with the intention of running. Waiting for the general election of 2015 was an option of course, but the prevailing logic in our household was that there are no guarantees about a future fought on new territory. It was now or never. What changed between Pride Day and today might better be looked at as what has changed in George Smitherman between 1998 and 2013. In 1998 seeking the nomination in Toronto Centre - Rosedale for the Provincial Liberals meant taking on a candidate well backed by the Ontario Medical Association. With a punishing tenacity we pounded the riding door by door and signed up legions of people to help us rid Ontario of Mike Harris. My nomination opponent dropped out before the actual meeting and the local PC MPP Al Leach dropped out too, refusing to seek re election or be held accountable for his megacity. For all the success that I had in that first nomination, fighting with Liberals isn't my strong suit. As a grunt volunteer, riding president, paid party organizer, Queen's Park, House of Commons and City Hall staffer, MPP and Minister my DNA is clear. First comes loyalty to the leader. There are times in my life when push came to shove. Anyone who knows me well can tell you that of all the awards and accolades I have ever received I covet my Tanya Harding Award from the Toronto Gay Hockey Association above all. In 2013 the only energy I can muster for politics is to help push and shove my leader forward. Forward to rid our country of a government that has a very different view of Canada than mine. I won't be a candidate now. I won't be contesting a riding in the 2015 general election or any other. I will, as always, be an active Liberal volunteer and I look forward to knocking on doors in Toronto Centre whenever the by election comes. First things first though, Michael, Kayla, Christopher, pack your bags. We leave for Costa Rica next Wednesday. We have taken our fork in the road.